With this 1823 law, (Johnson v. M’Intosh), the Supreme Court institutionalized racial discrimination against the Indians. It guaranteed that the Indians would never win their treaty land back in a court of law. In America, not only is justice blind, it is crazier that a bat. The gist of this law says that Indians owned the land right up to the point that Columbus “discovered” it. This law deserves to be dragged from the vaults of America’s Freemasonry past and made to stand in the light of day. Most South Dakotans know their history. Who can forget the seizure of the Homestake Gold Mine? As President Grant said at the time, “Gold has been discovered in the Black Hills, a portion of the Sioux reservation”. Even this event would have been expunged from the history books had it not been for a new technology at the time---photography. 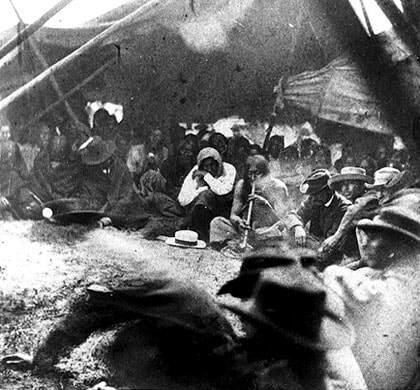 The photographs have burned into American memory the images of the dead, piled high and about to be thrown into the mass grave at Wounded Knee. What must never be forgotten by everyone are the laws that justify land grabbing . The tactics in the past the government used against other tribes with treaties must never be forgotten. Only in the light of past legal precedent can racist colonial law be understood. The chilling lesson to be learned is to never venture into the white man’s court seeking treaty rights because you cannot win in a kangaroo court. All that has ever been gained by taking a treaty into the white man’s court is not land rights but a tiny monetary settlement dangled in front of an impoverished people for their homeland. The U.S. Government cited Johnson v. M’Intosh in 2001 when giving their reason for ignoring the Treaty of Ruby Valley of 1863 with the Western Shoshone. During World War II, Hitler had a policy of land seizure called “Lebensraum”--living space. He justified seizing other peoples lands because the German people needed living space. Do you know where he got such an idea? I will give you a hint. He referred to those people already living in those lands as “natives”. Speaking of the Jews and the Slavs he once said, “The natives will be our Redskins”. This is a direct correlation between the Jewish Holocaust and genocide in America. Genocide began in Germany during World War II with an attitude of “Aryan” white supremacy. Laws were made which literally took away the homes and lands of Jews and others who were not German. It was this same attitude that was painfully on display for all the world to see in 21st Century America. At Standing Rock, Native Americans who had lived on the land from time immemorial were arrested as trespassers and labeled terrorists. Confrontations such as this in the past would have resulted in the Indians being expunged from the face of the earth and American memory had it not been for the advent of videography and social media. Apparently South Dakotans have had enough of being part of an American Dream that is an American nightmare for Native Americans. Living under the rule of law is desirable but witnessing unjust laws that dispossess an entire people in Nazi-like fashion was just too much to bear.